Zero-waste temple: This is where, my friends, God smiles! There’s this beautiful peepal tree with its roots resting in infinity and boughs arching over the Sri Shakthi Kalyana Mahaganapathi Temple located at Kalyana Nagar, Banaswadi. 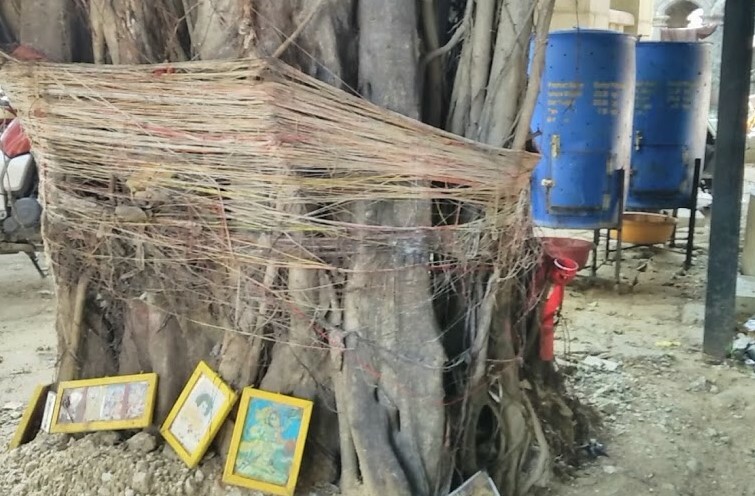 True, almost every temple or village in India has at least one such tree standing tall in all its nakedness with a lump of sacred threads wound around it. No one can say for sure what each thread would mean individually: Pain, anguish, victory, desire, devotion, gratitude, joy or frustration. But weave them together, a firm pattern of meaning emerges on its own: unconditional surrender. As beautiful as this solace-seeking devotion is, there’s no denying that it takes just a few seconds for the same devotees to defile the premises with unholy trash. This is the reason why each Indian temple is a living paradox, a mute spectator that witnesses gene-deep devotion and utterly cavalier desecration happening all at once. But there’s something holier about this tree and its neighbours, swaying gently to the winds of change blowing over this temple. The change that came in the garb of social responsibility when the management turned the corner and transformed the entire vicinity into a zero-waste zone. Until 6-8 months ago, the temple had its own usual garbage pick-up issues with mounds of it rotting right at its entrance. They contained organic and non-biodegradable waste all mixed up beyond remedy: flowers, leaves, fruits, coconuts, incense sticks, camphor, cloth pieces, disposable cups and plates, etc. On days when BBMP pourakarmikas failed to pick up the trash, problems multiplied. One of the trustees Ashok Betraj and his sister Anupama Harish were aware of the landfill crisis and also, more importantly, the solutions available to mitigate the same. 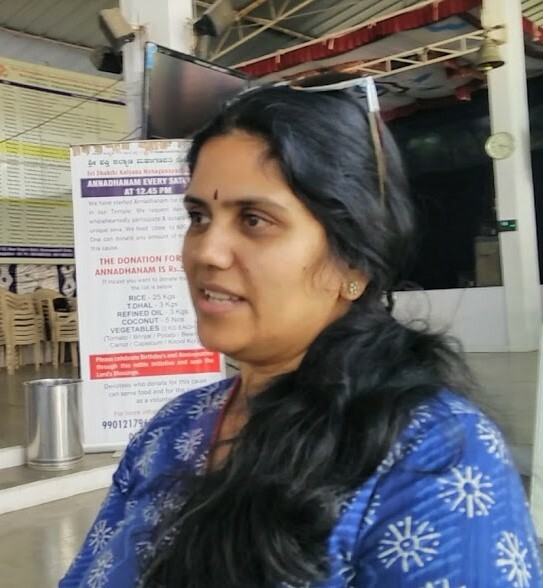 Anupama, an activist who loves to compost at home and also works towards bringing in more neighbours into the fold, prevailed upon Ashok and got things going. The first step was to arrest the flow of disposable items into the premises. They banned all non-biodegradable plastic, styrofoam plates, glass containers and switched to steel ones. Plastic carrybags were replaced with cloth ones. Once, a devotee even protested when he was denied ‘prasada’ for not bringing his own container. Ashok refused to budge. “But the next time, the same person got his own steel container and I was happy to see the transformation,” he says. The management hired Quantum Leaf to set up organic composting systems to take care of its kitchen rejects and the remaining organic matter that came in the form of pooja items/rejects, fallen leaves, twigs and branches on the premises. “We cook ‘prasada’ every day and have to deal with up to 10 kgs of kitchen waste per day. It also includes the kitchen waste generated by our staff members who live on the premises,” says Ashok. As of now, two Sudh-Labh blue barrels are efficiently handling the kitchen waste. Five leaf composters have been installed to compost all the remaining organic matter, mainly flowers, tulsi leaves, ‘donne’ rejects, etc. 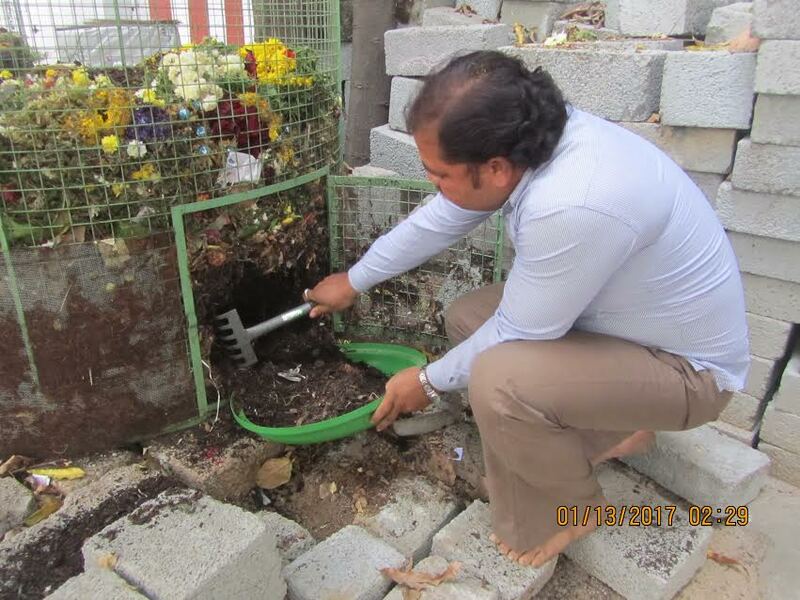 According to Ashok and Anupama, many devotees love to take this ‘holy’ compost back home. Since almost all the waste problems are being handled inside the temple premises, the dependence on BBMP contractors is almost nil. It is the same freedom from outside agencies, government or private, that actually funds the composting projects inside. A win-win situation. Something that all holy places, irrespective of religion, can emulate with ease. The following side-show takes you through the process of converting all the organic waste generated on the temple premises using two simple composting methods. (Pics by Vasuki Iyengar & SH). To keep the people interested and have them engage their intrinsic values continuously, the management has been coming up with “green themes” for festivals and celebrations and faith-based environmental education as and when the occasion arises. Gullu is the man behind the mission. He is the heart and soul of all the sustainable waste management activities going on in this temple. 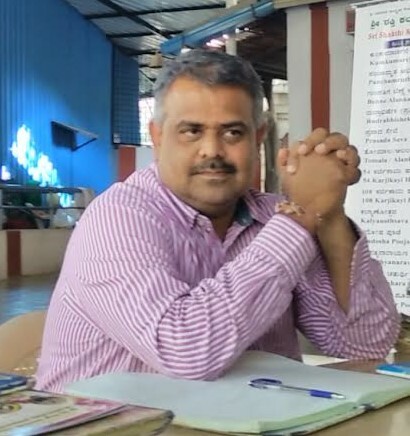 Having initiated the change and being part of this beautiful process, Ashok firmly believes in the pivotal role temples can play in instilling a sense of responsibility among people to first reduce waste generation and then find a meaningful destination for organic waste. To compost kitchen waste, Sudh-Labh blue barrels are being used. Click here for more details. To compost leaf and flower waste, leaf composters are being used. For both methods, you may contact Sudh-Labh, No. C-3, 906, L & T South City, Bannerghatta Road, Bangalore 560076, Phone: +91 98456 90778. http://www.sudh-labh.in. 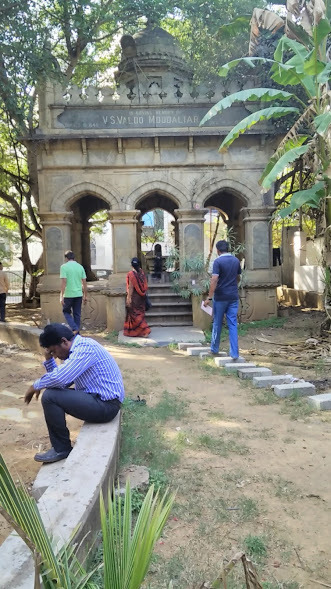 This entry was posted in Community Composting, Endlessly Green and tagged community composting, Endlessly Green, leaf composters, Savita Hiremath, Sudh-Labh blue barrel composters, temple trash, zero-waste temple. Bookmark the permalink. If we want to do shram-dana the next time they want to harvest the composters, how do we figure when the harvesting will happen? I have no idea! You will have to check with the temple authorities.